Do you want to relax by the beach this summer? 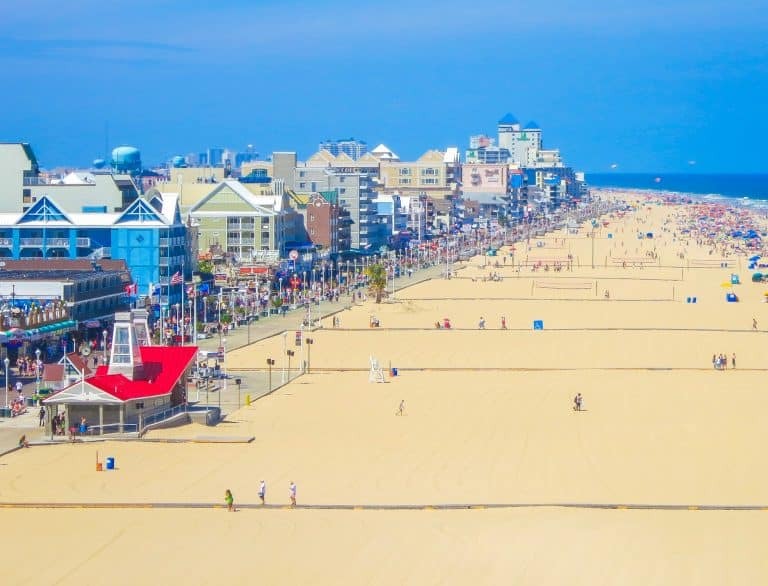 A vacation in Rehoboth Beach, Delaware and on the Eastern Shore is only a few hours from Washington DC, Baltimore, Philadelphia, and Northern Virginia. A summer vacation on the Delmarva Peninsula is one that your kids will remember for a lifetime! It’s not all boardwalks, Ferris wheels, and fries on the Eastern Shore. 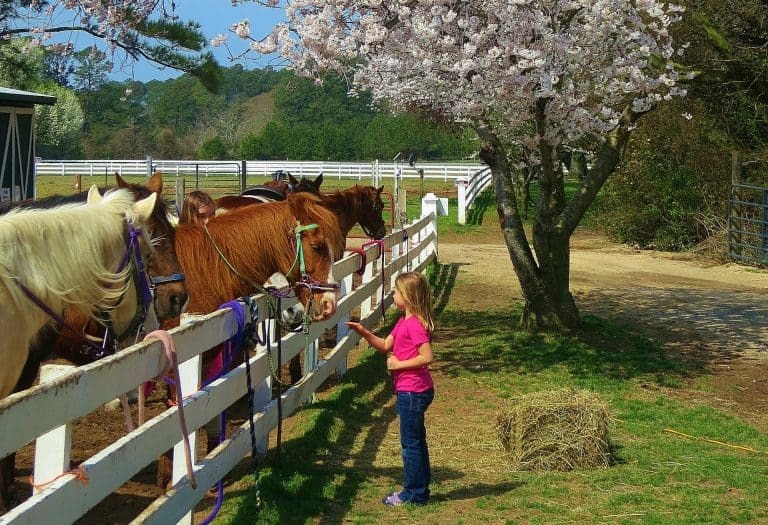 Escape to the Eastern Shore of Virginia and enjoy a horseback ride along the Chesapeake Bay. Or, go find the ponies on Assateague Island. Play a game of putt-putt in Ocean City, or enjoy a relaxing getaway at the Hyatt Chesapeake Bay Resort. Just head east across the Chesapeake Bay Bridge and a variety of relaxing Eastern Shore vacations await. Whether it’s just for one night or for the entire month of August, there’s an option for every family, every budget, and every vacation style. I will always remember watching my children run into the Atlantic Ocean for the very first time at Rehoboth Beach. 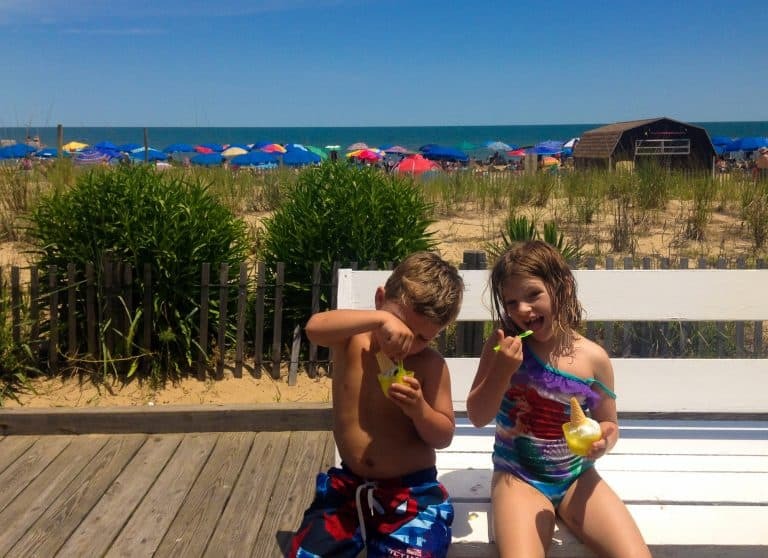 A visit to a Delaware beach is a summer must do for many Mid-Atlantic families, and Rehoboth Beach is often voted a family favorite on the East Coast. Just off the beach there are loads of snack options for hungry, tired kiddos. Of course, my kids love the ice cream the best! If you seek a peaceful, outdoorsy vacation for your family, consider camping at Trap Pond State Park in the southwestern corner of Delaware. Trap Pond State Park is popular with RV campers but also has a quiet tent camping loop, secluded island camp sites and cabin camping available. These lovely campsites are less than an hour from most of the Eastern Shore’s most popular beaches; so it is totally possible to have a beach day while staying at Trap Pond. The highlight of any visit to Trap Pond is getting out on the water! 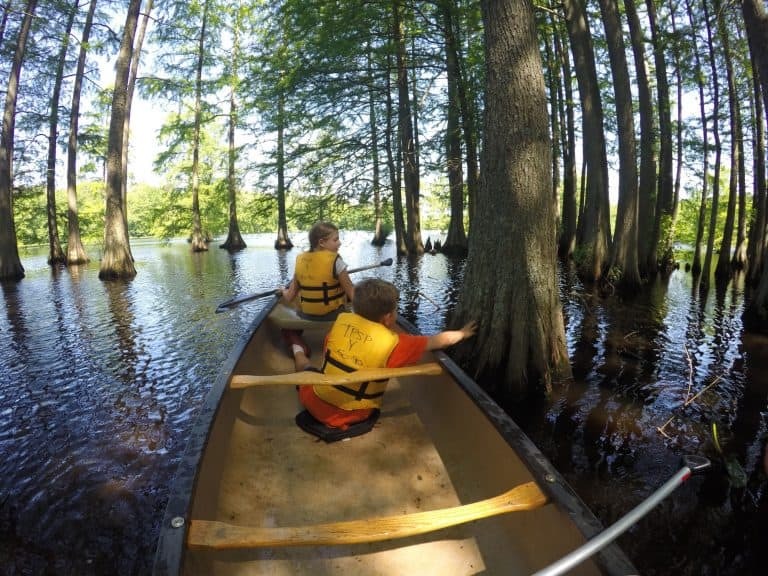 The knowledgeable state park staff offer guided tours of the pond and waterways on the park’s pontoon boat, but the best way to experience the beautiful cypress trees and still waters of the pond is to kayak or canoe through amongst the trees. After spending a few days experiencing Ocean City, Maryland with my kids, I can see why it’s a summer tradition for so many families. We stayed at the Holiday Inn on 60th Street where we enjoyed spending the first and last hours of our day down at the beach. At 60th Street, the beach is quiet; it is blocks beyond the hustle and bustle of the Boardwalk which ends at 28th Street. As the tide came in at the end of the day, my young children splashed in the pools formed by the fresh, incoming ocean water. In the mornings, we’d come out to the beach to find the shells that had washed up during high tide overnight. At 5 and 6, my kids were the perfect ages to enjoy Ocean’s City’s Jolly Roger Amusements. The joy on their faces as they rode the kiddie roller coaster for the third time in a row at the amusement park on 30th Street, were tossed about in the wave pool at Splash Mountain Water Park, and hit their first ever hole-in-one at the Jungle miniature golf course were priceless. Jolly Roger is not just for the little ones though. Some of my favorite Ocean City memories were watching the sunset from the top of the Ferris wheel at 30th Street. 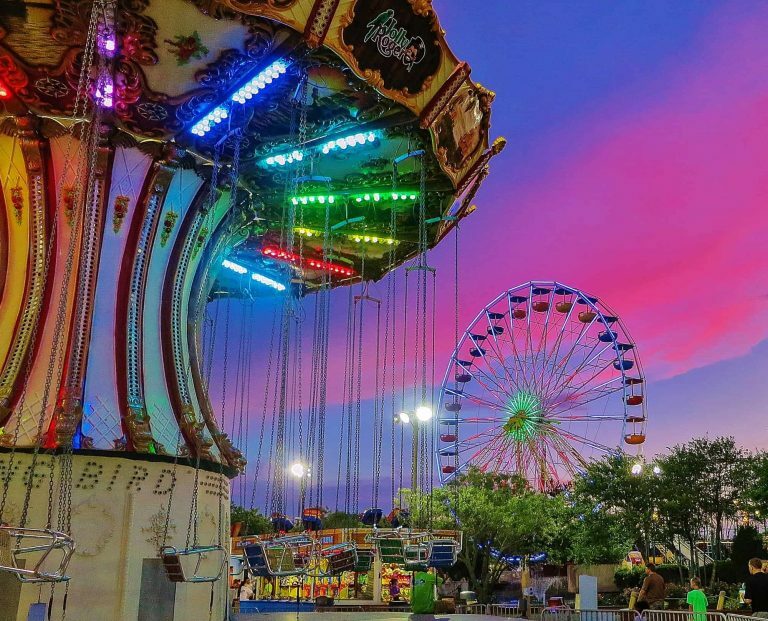 The Ferris wheel and other thrill rides at Jolly Roger on the Pier are not to be missed either, as they provide spectacular views of Ocean City’s Beach and Boardwalk. If it just happens to rain on your family’s vacation in Ocean City, no worries. The list of things to do indoors in Ocean City is surprisingly long. On the Boardwalk, the Ocean City Life Saving Station Museum is worth a stop rain or shine. With its innovative scavenger hunt and play area for younger children, everyone in the family is sure to learn something about the local area. Just down the Boardwalk is Ripley’s Believe it Or Not. Families with older children will love the oddities and amazement found in the collection. Finally, if you’re just looking for some fun, Planet Maze is an indoor attraction for all ages with an indoor climbing maze for the little ones and laser tag for those who have outgrown the colorful pit of plastic balls. Explore all the kid-friendly fun in Ocean City. I grew-up in a small beach town on the California coast, so it only took a few moments sitting along the shore of the Chesapeake Bay on the Cape Charles Beach in Virginia for me to totally fall in love. My kids, however, fell head-over-heels for the animals at Pfeiffer Riding Stables. There are few things that are more relaxing than a trail ride through the forest and along the river, and my kids were entranced as the horses carried them along the trail. Of course, any good vacation destination has amazing restaurants. While there are not a whole lot of different restaurants to choose from in Cape Charles, I could eat at the restaurants in town for days without ordering the same dish twice. We started off our morning at the Cape Charles Coffee House. A waffle at the coffee house inside a restored bank that’s over one hundred years old is a great way to begin the day. Ending the day watching the sun set over the bay at the Shanty, a seafood restaurant on the Marina, is idyllic – even with the kids. While the kids play corn hole next to the restaurant’s porch, mom and dad can enjoy the fried flounder basket or oyster po’ boy sandwich depending upon the season and what’s fresh. Chincoteague is the perfect place to stay when exploring Assateague Island National Seashore and Virginia’s Barrier Islands. From the window of our hotel room at the Best Western Plus Chincoteague Island we could see the island’s iconic lighthouse, and we were only a ten minute drive away from the spring pony penning site near the beach. Chincoteague Island is convenient because the small town has all the amenities that a traveling family could ever need and yet is right on the doorstep of the mid-Atlantic’s most interesting stretch of natural coastline. While based in Chincoteague, my kids and I took an eco-tour out of Wachapreague to Virginia’s Barrier Islands. We wandered a deserted sand bar collecting a few shells and watched a pod of dolphins as they fed in the channel. 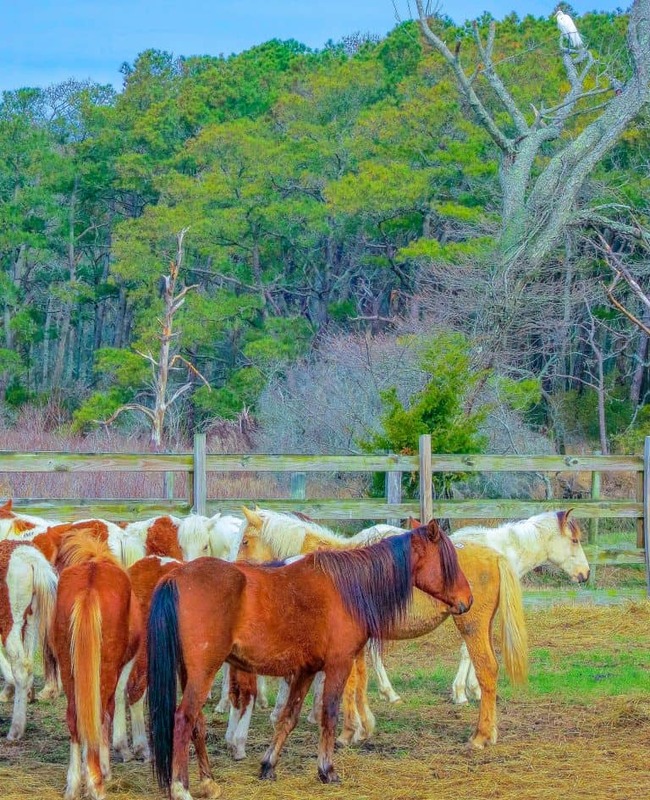 The wild Chincoteague ponies are not to be missed. The herd in the southern section of Assateague Island is much smaller than the herd up on the north end of the island near Ocean City. But, on pony penning day, the southern herd is much more accessible; we were able to drive right up and watch the pony get their spring veterinarian check-up. In the spring it is common to see newborn foals, and we had the privilege of watching a pony less than a week old. Later we visited the Museum of Chincoteague Island and learned all about Misty of Chincoteague, the pony from the children’s book that made the herd of wild ponies on Assateague Island well-known by young horse-lovers across the country. 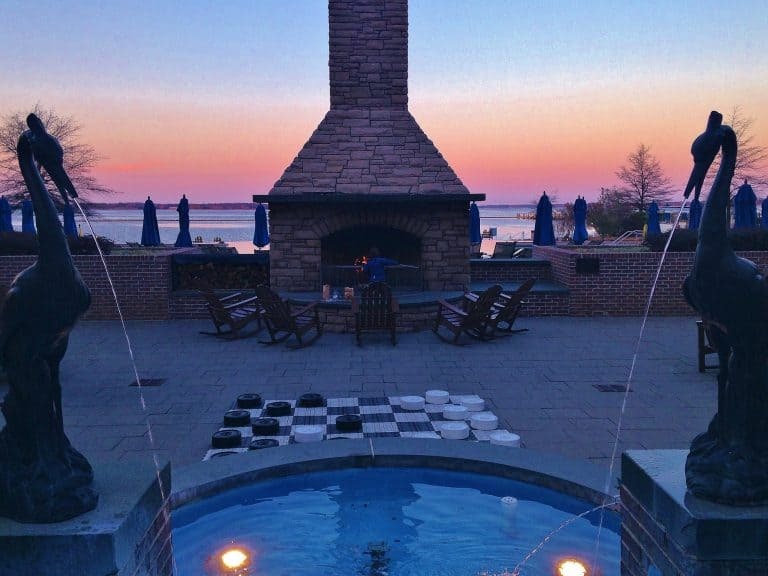 The Hyatt Regency Chesapeake Bay is the perfect place for families looking for a quick getaway from the Washington DC Metro area. 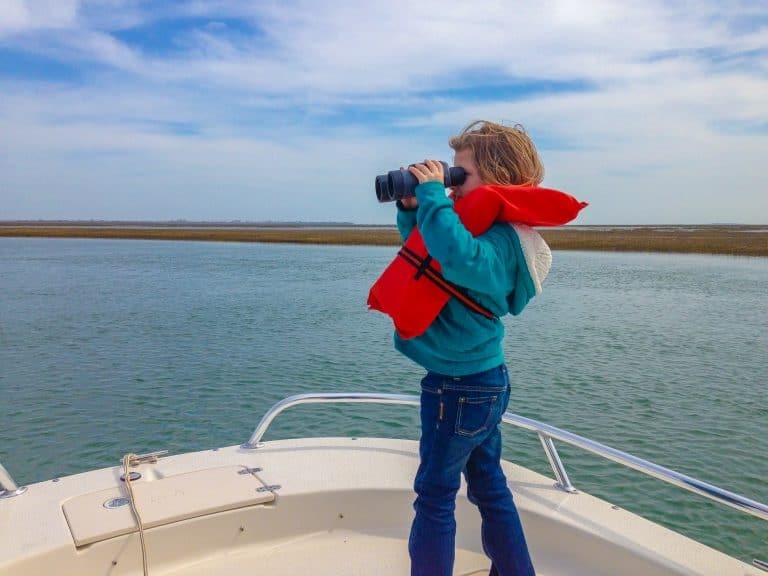 While families could easily spend days lounging poolside, the nearby Blackwater National Wildlife Refuge, Harriet Tubman Historic sites, and Chesapeake Bay Maritime Museum up in Talbot County’s St Michaels beckon as possible adventures. If you can pull your kids away from the game room and mini golf course at the resort, the Blackwater National Wildlife Refuge, just twenty minutes down the road, is one of the best places to spot bald eagles in the lower 48 states. Drive through the park, stopping at the viewpoints to watch the raptors soar over the marsh and fish in the nearby ponds. Lots of waterfowl enjoy this preserve. On the day of our visit swans were swimming just outside the visitor center. There is now a new educational complex honoring the life of Harriet Tubman whose Underground Railroad ran through this section of Maryland’s Eastern Shore just across the street from the wildlife refuge. Kids can earn a junior ranger badge while learning about Harriet Tubman at the Harriet Tubman Underground Railroad Visitor Center. Looking for more ideas for a Maryland vacation? 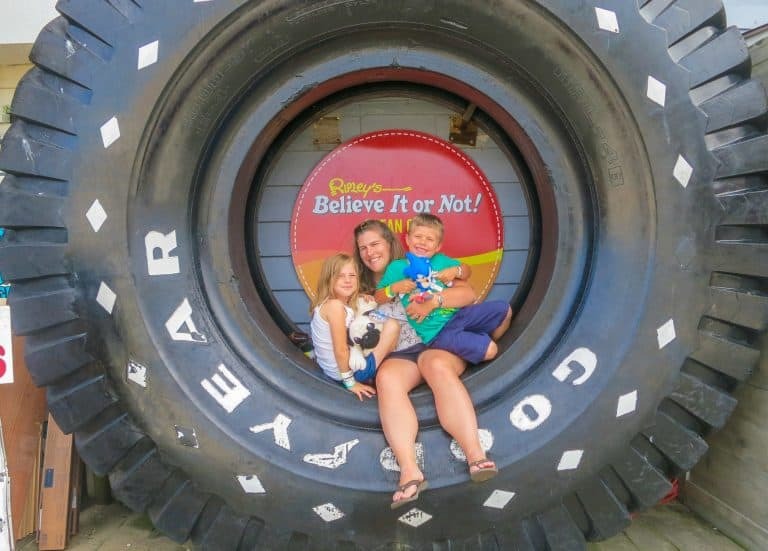 Check out Trekaroo’s list of Top 10 Things for your Family to Do in Maryland. 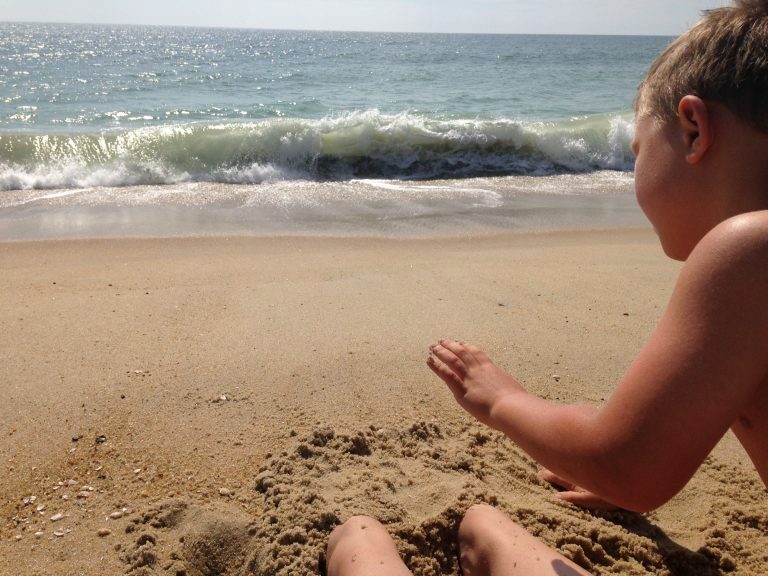 Looking for Budget-Friendly Family Hotels near the Beach in Maryland? As the humidity rises in Washington DC, the prices of an Eastern Shore family vacation rise. If your family is looking for something truly special for the kids that will not break the bank, consider the Carousel Oceanfront Hotel and Condominiums at the northern end of Ocean City or the Francis Scott Key Resort in West Ocean City. 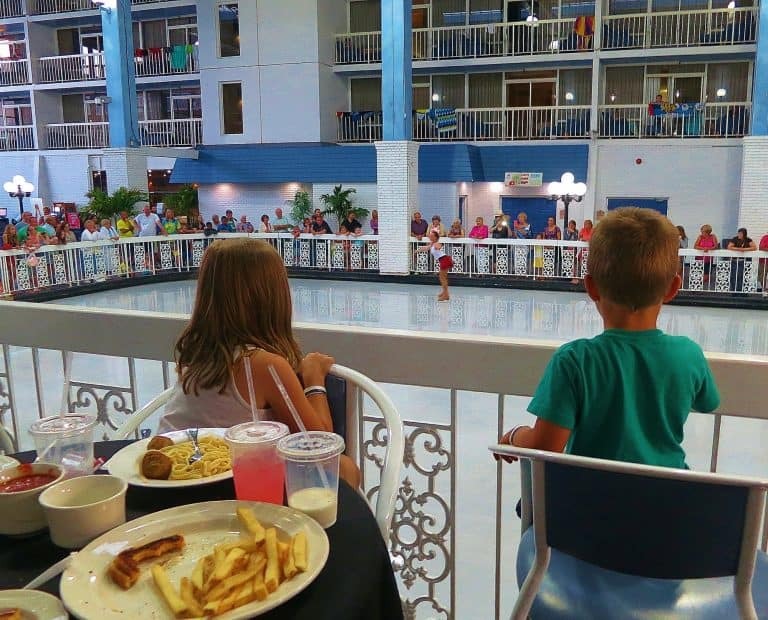 The Carousel Hotel boasts the only ice skating rink in Ocean City, a nightly, free ice skating show in the summer months, a nice indoor pool, and beachfront location that hosts movies on the beach weekly throughout the summer season. Yes, my kids spent the drive home from the beach writing to their grandma about the ice rink at our hotel. If a beachfront location is not important to your family, the Francis Scott Key Family Resort has both indoor and outdoor pirate-themed water parks on site. With a full schedule of activities available, families can enjoy playing and relaxing together all day long. And, they offer complimentary shuttles to the Ocean City Beach and Boardwalk, so you don’t have to miss out on the beach after all. Disclosure: The author was hosted by the Eastern Shore of Virginia Tourism Commission, Hyatt Regency Chesapeake Bay, and several attractions and hotels in Ocean City, MD so that she could provide Trekaroo’s readers with the details about traveling with kids to the Eastern Shore. All opinions are her own.